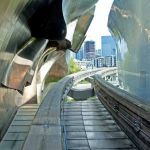 This smart modern city that is steeped in American heritage offers a seamless array of attractions to satisfy an eclectic range of tastes. 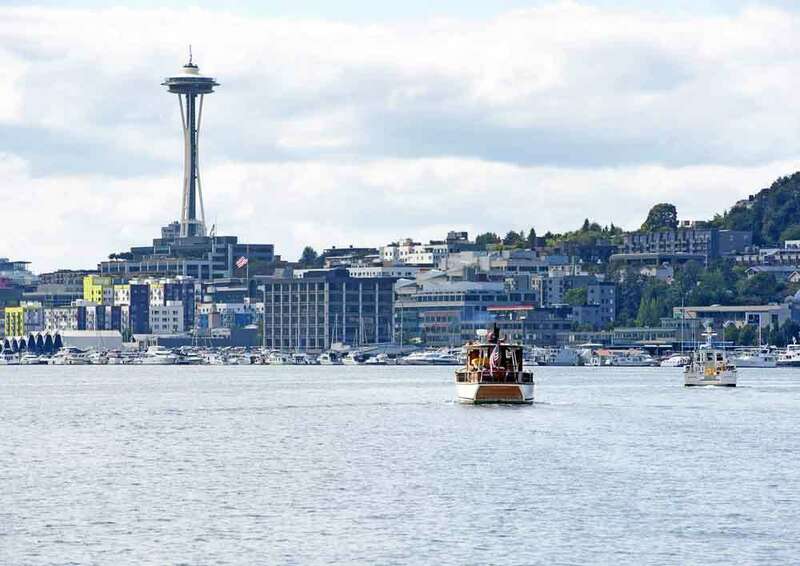 Seattle, situated on Puget Sound in the Pacific Northwestern seaboard, affords easy access to the surrounding mountains, sea and evergreen forests but is itself a hub of interest and cultural distractions that should persuade you to stay longer before heading for the hills. 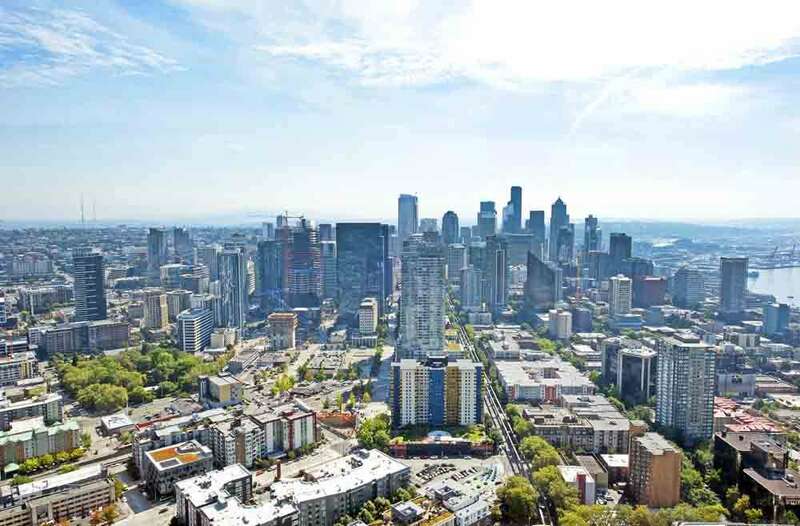 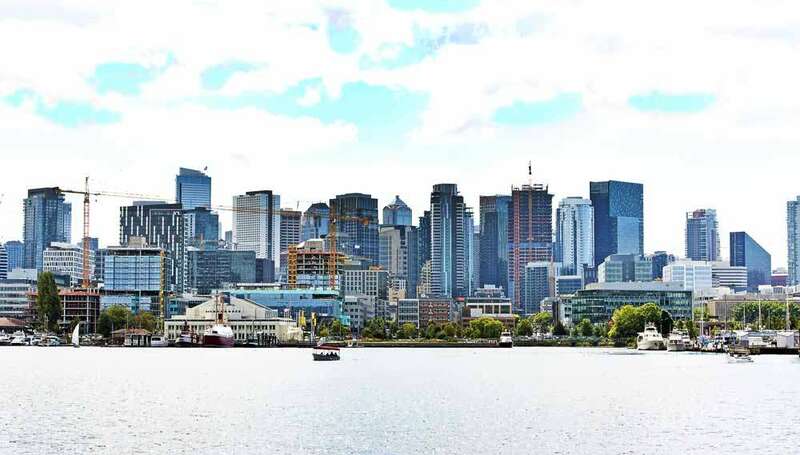 As the original home of Boeing Aircraft Corporation and more recently Microsoft and Amazon headquarters, it’s too easy to dismiss the city as a focal point of high tech industries with a population dedicated to the world outside. 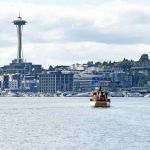 Seattle, in fact provides a seemingly endless collection of interests that join together to fill any visitor’s days with a sense of wonder and reward. 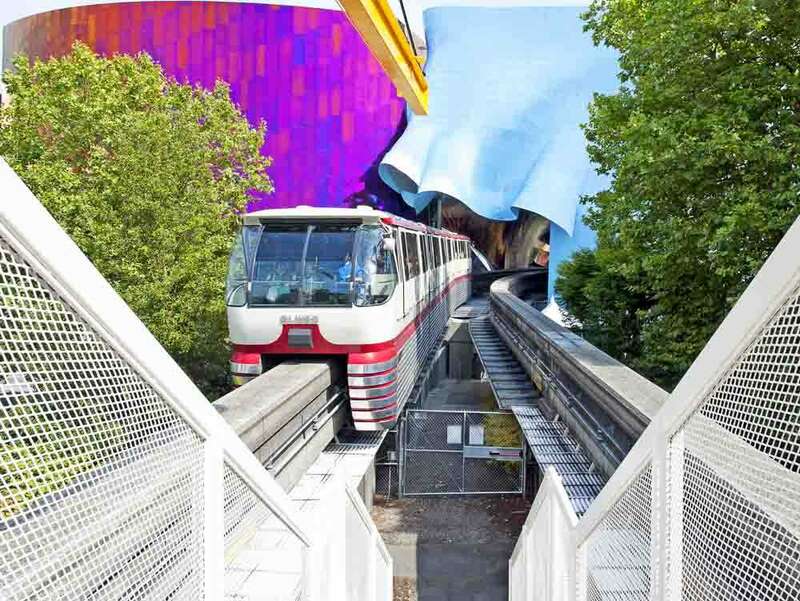 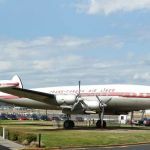 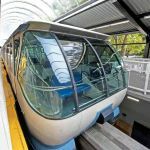 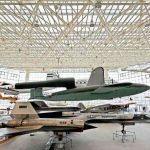 In addition to the more natural pursuits of walking, jogging or cycling through the thousands of acres of parkland in Washington State’s largest city, there’s an extremely well presented set of attractions that chart the development of business, technology and commerce that will keep visitors of all ages and interests enthralled. 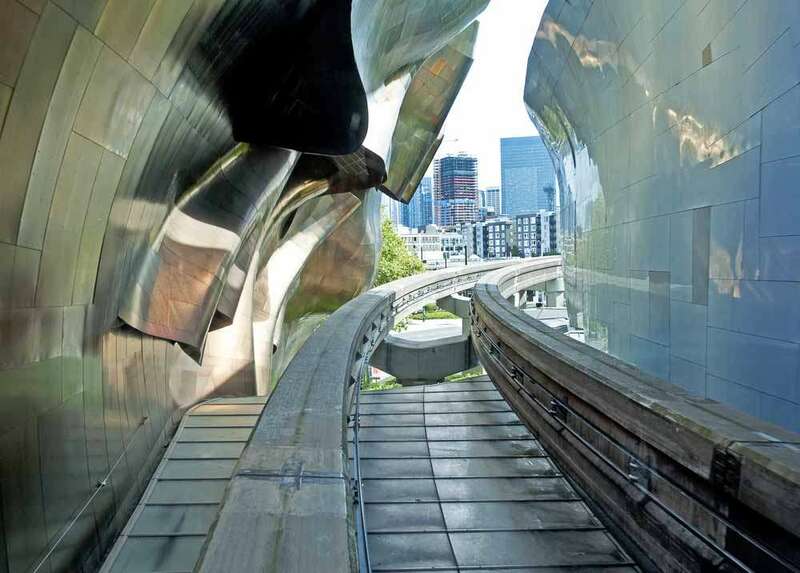 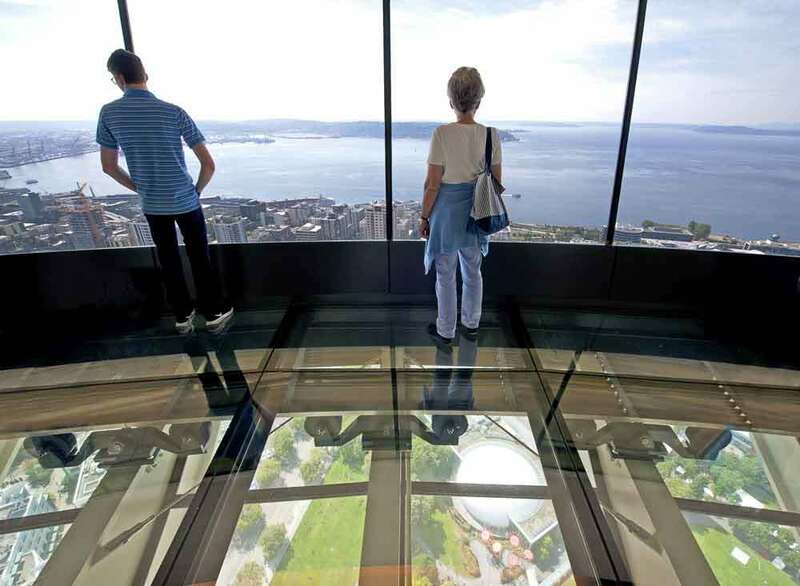 Let us take you on a seamless journey through Seattle’s history and future growth by joining together some of its more fascinating attractions. 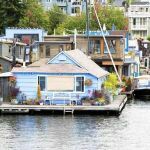 A boat ride around a lake is a relaxing way to view the city from a more peaceful platform than when immersed in its busy streets – but also affords you the opportunity to follow the development of the city from its earliest roots. 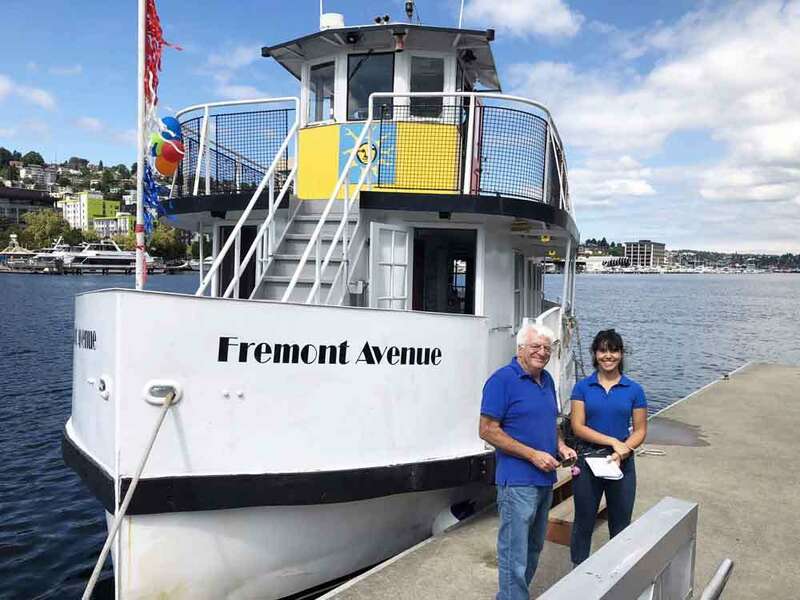 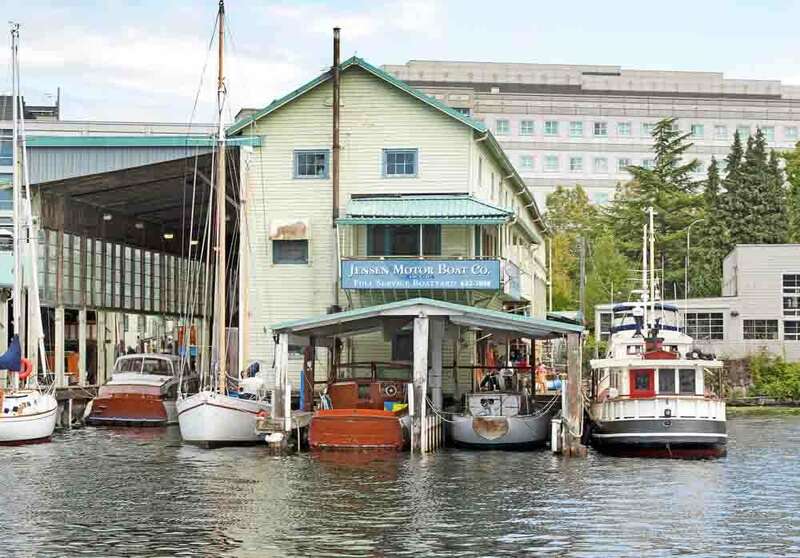 We board the Freemont Avenue, of the ‘Seattle Ferry Service’ an old pleasure craft now run by crusty, cordial Larry Kezner who moors his boat on a jetty at Lake Union Park. 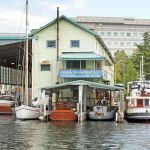 It’s not the easiest to find (especially if it’s out on a cruise already) as there are no signs that tell you where it docks – either online or at the wharf – the only indication being on his leaflet that you can’t get until he gives you one! 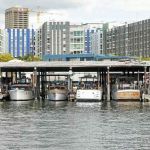 Its embarkation point is located adjacent and to the left of a jetty where three historic ships are moored in Lake Union Park. 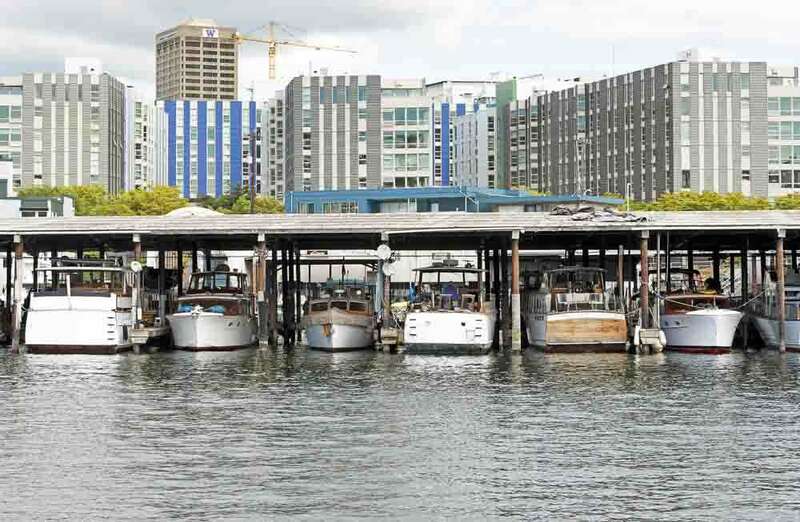 One of the first sights we see on the cruise are some of the original wooden houseboats (made famous in the film ‘Sleepless in Seattle’) , some built as early as 1920 and as old as Seattle itself. 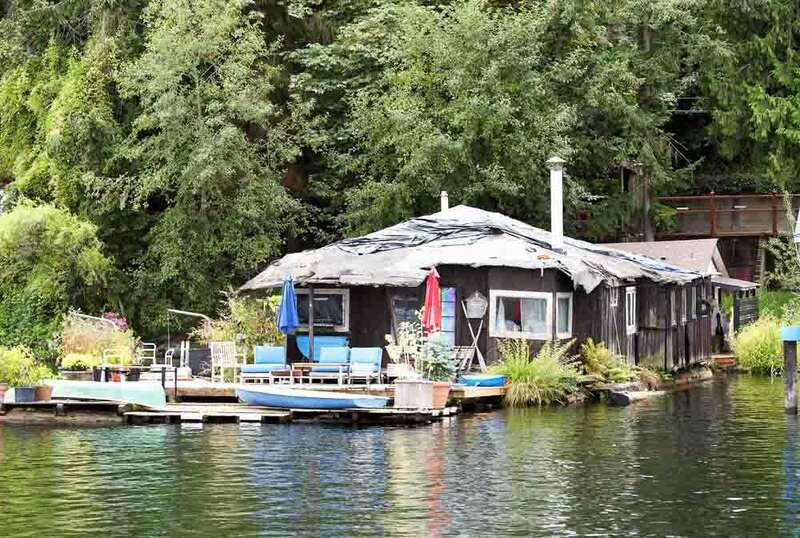 Crude one-storey wooden shacks on log rafts were originally the homes of loggers who floated along with their sea of logs between forests and sawmills. 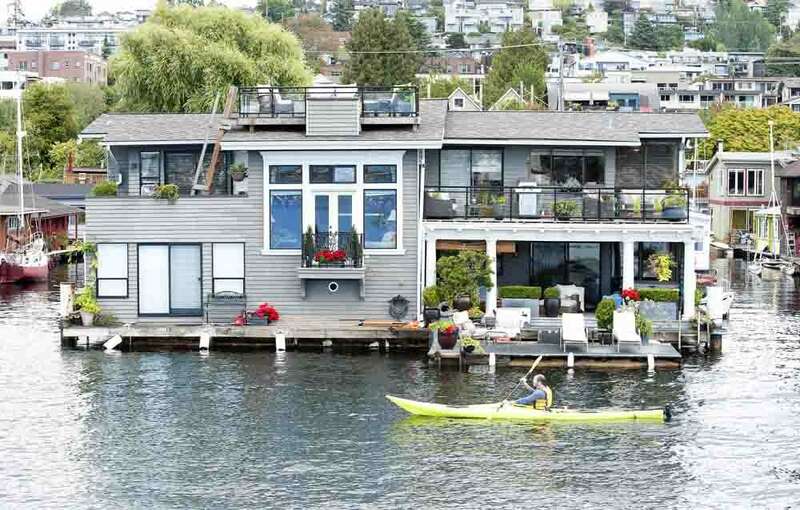 Later, fishermen, boat makers, and a few bootleggers and other questionable types with business on the waterfront populated the houseboats, followed somewhat inevitably, by more wealthy owners in search of leisure on the lake shore. 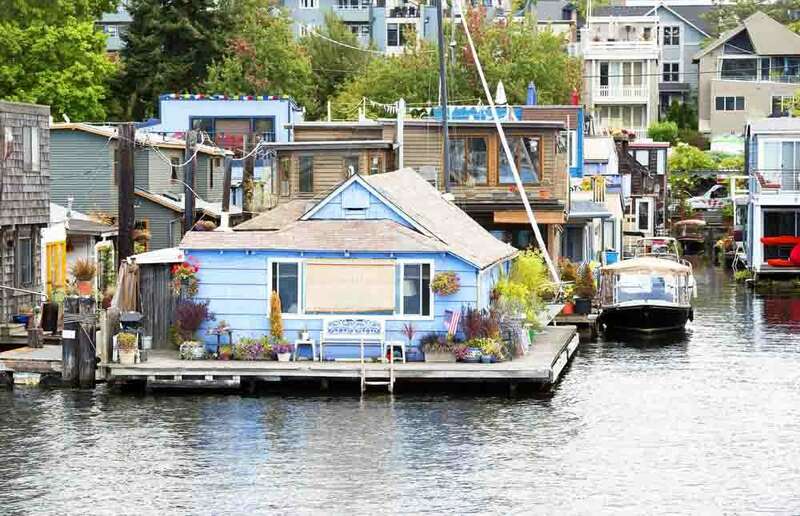 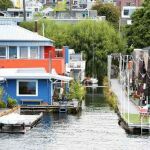 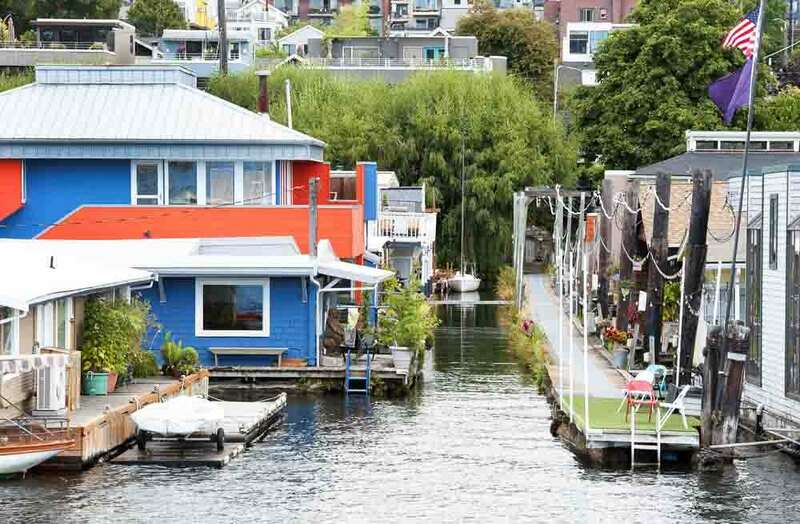 The houseboats chart cultural change in Seattle – in as much as the 30’s saw the poor, desperate for accommodation, constructing them from the flotsam that floated around the lake, a more Bohemian crowd inhabiting them in the 50’s and 60’s and many a dignitary having used them during their college years as student accommodation. 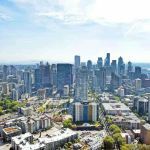 Various efforts to clear up the ‘Cesspool of Seattle’ resulted in ongoing conflict between owners and the city. 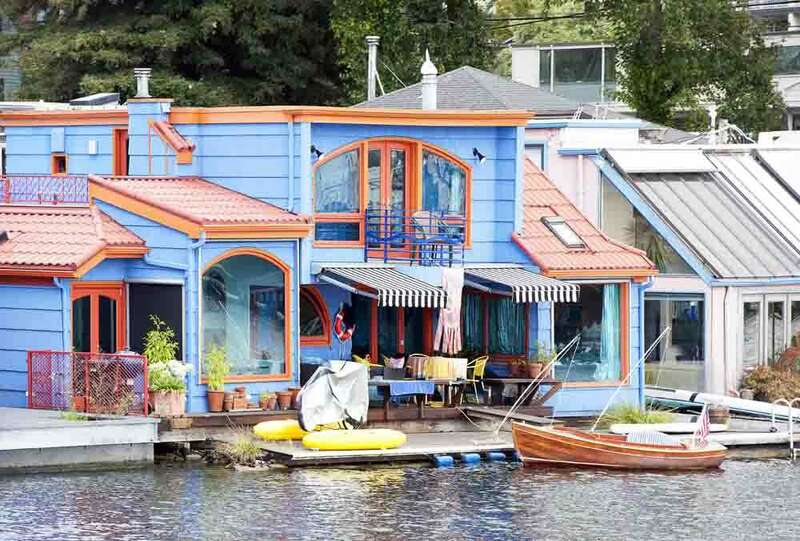 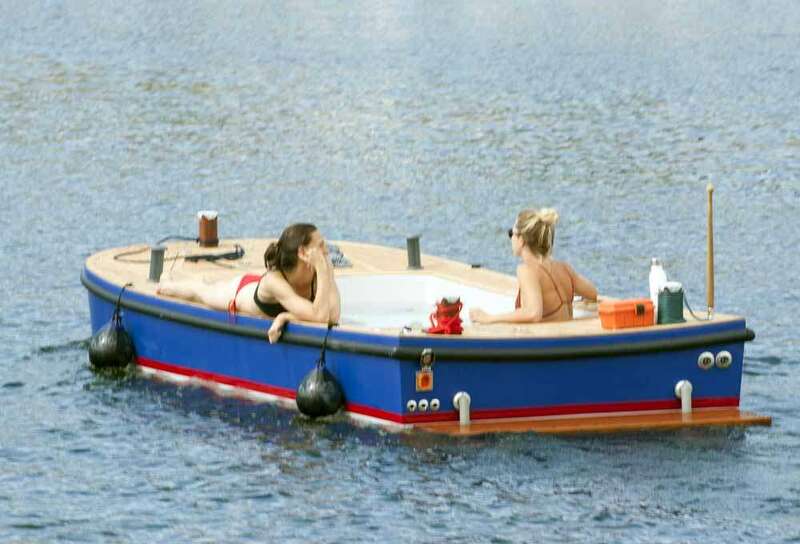 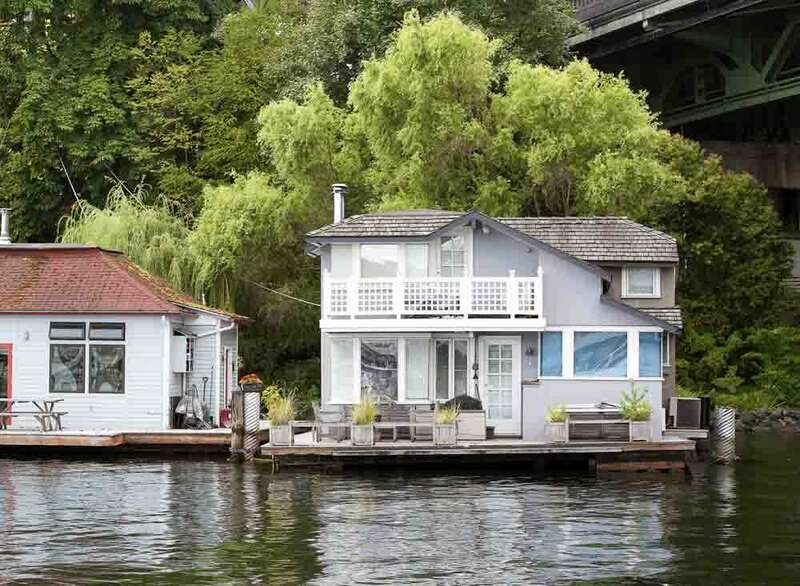 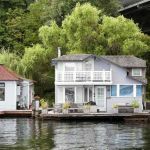 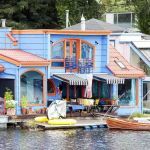 With the eventual introduction of sewage systems, more efficient cement and Styrofoam platforms rather than log rafts, the houseboats became an inspiration to architects and the style flourished, despite the efforts of many avaricious mooring owners. 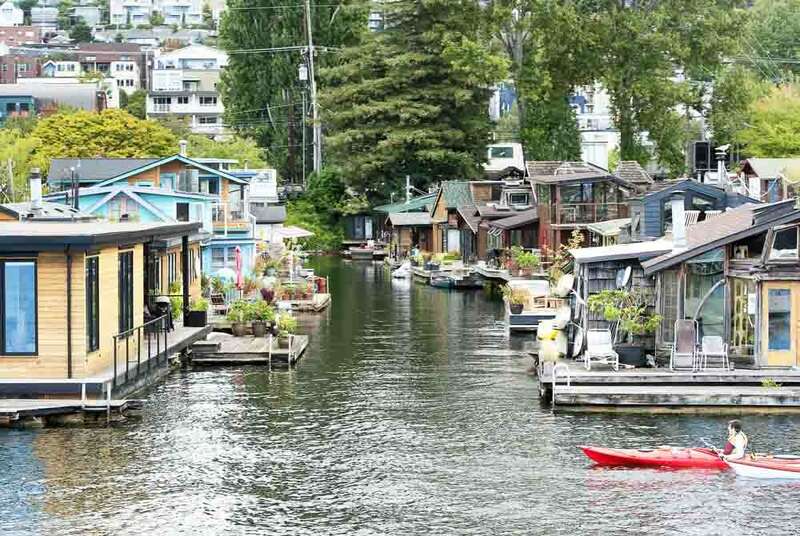 Their quest for survival has been through choppy waters for the last 25 years but has drawn the residents together as a community in a way unmatched by any other neighborhood in the city. 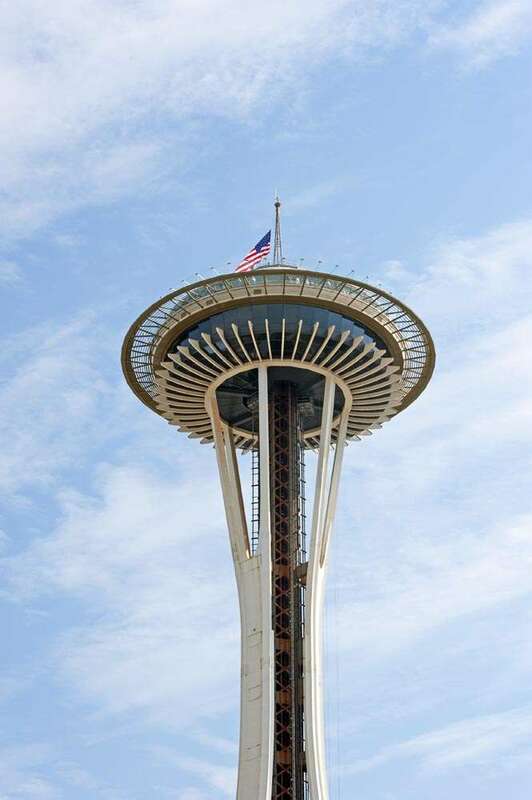 It would seem as if they’re here to stay now as a colourfully iconic picture of Seattle’s history. 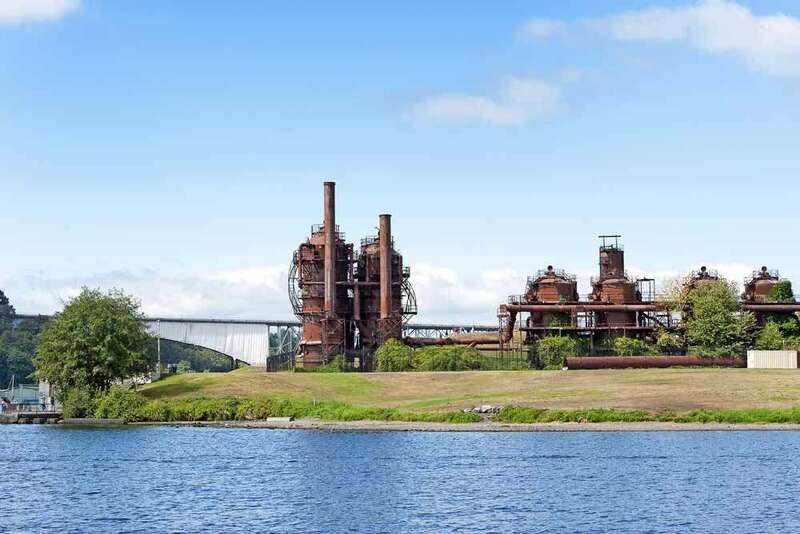 Other sights you’ll see on your cruise include the ‘Old Gasworks’, now a recreational area, the old lifting bridge, Jensen’s Boatyard (notorious for building both prohibition busting speedboats and customs boats), the occasional ‘floating jacuzzi’, plus the jetty where seaplanes arrive and depart – and where the late Paul Allen of Microsoft moored his helipad boat to circumvent regulations that prohibited him from landing on his own lakeside property! 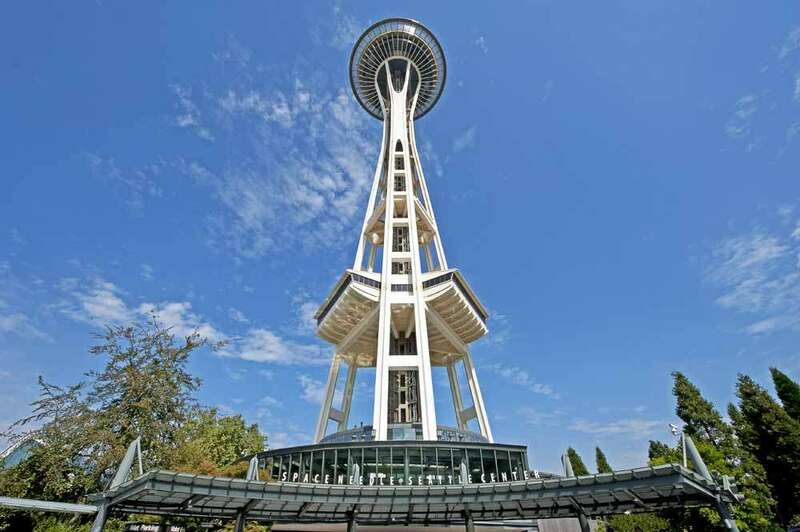 An icon of the World’s Fair in 62, the Space Needle is little more than a spire with an observation ‘disc’ on top – but as with most high places they hold a fascination that is little diminished by time or at 520 ft (160 m) by having been eclipsed in height elsewhere many times over in subsequent years. 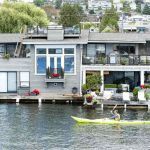 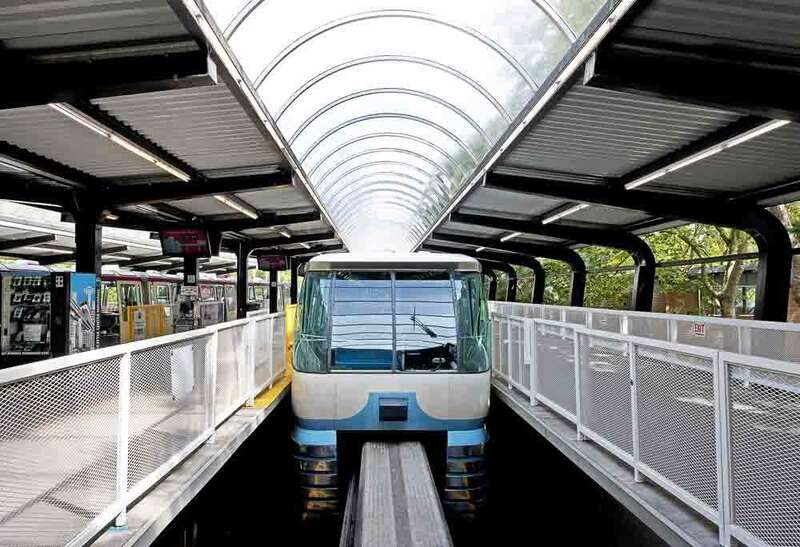 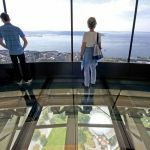 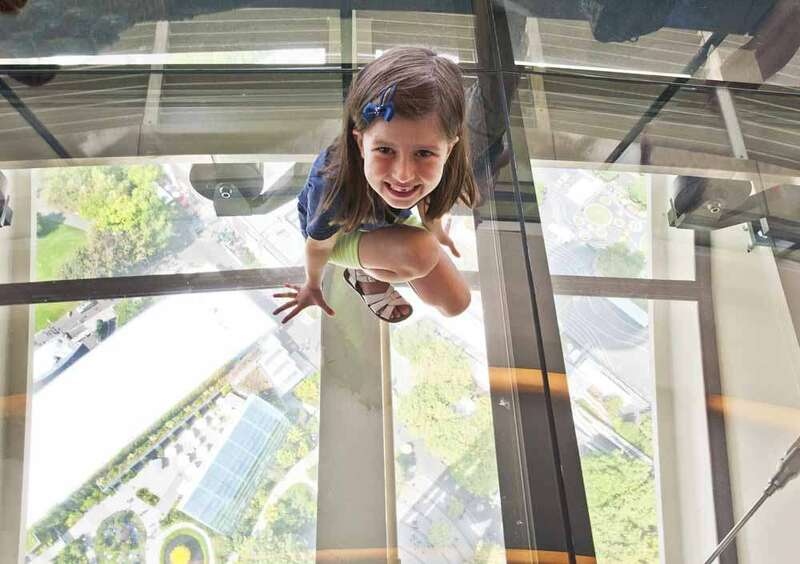 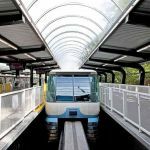 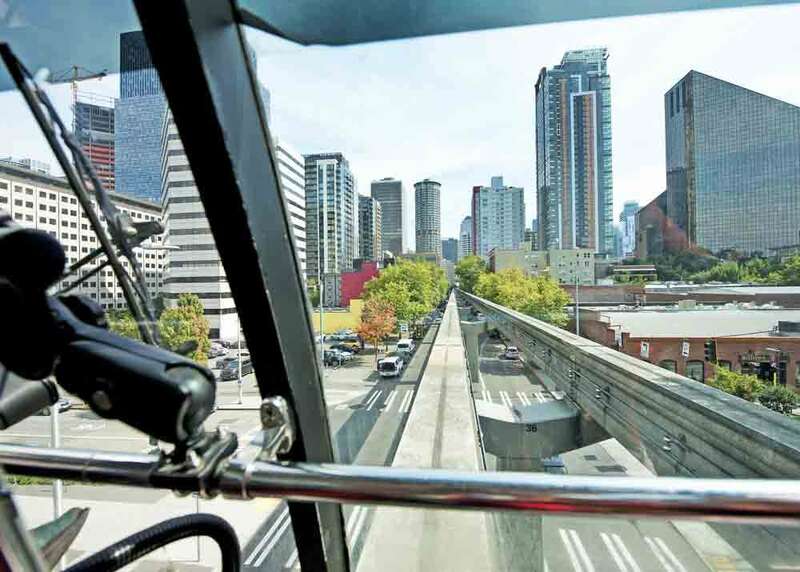 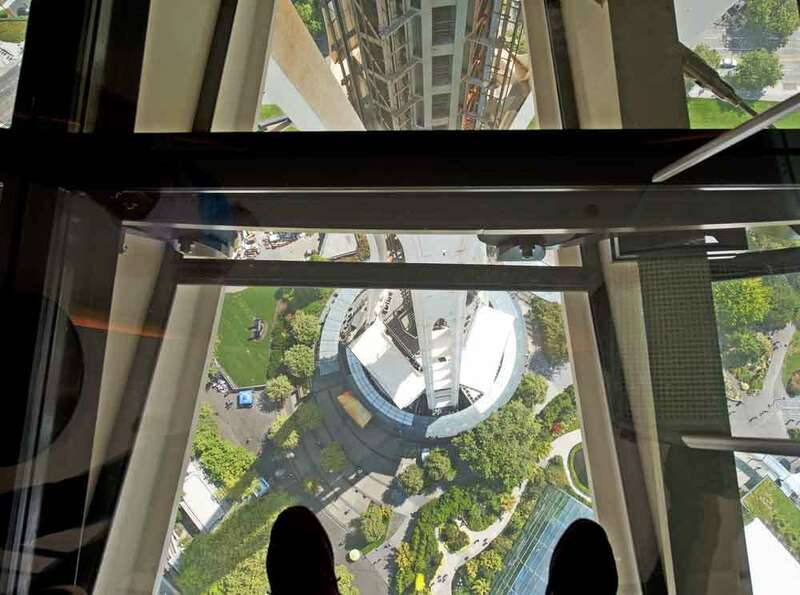 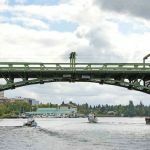 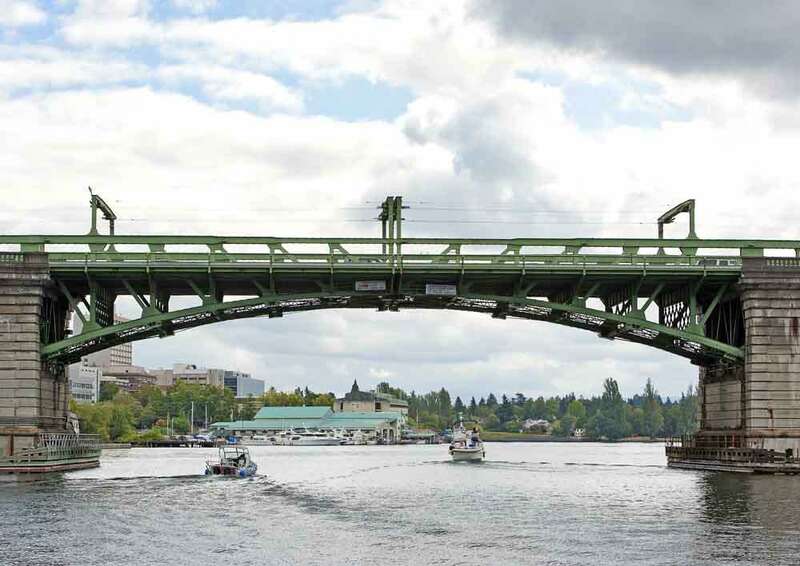 The novel revolving deck on the penultimate, most-highest accessible deck is reached by lifts in 40seconds and gives a constantly changing vista across the whole city, Lake Union and Puget Sound – or down between your feet through the transparent floor. 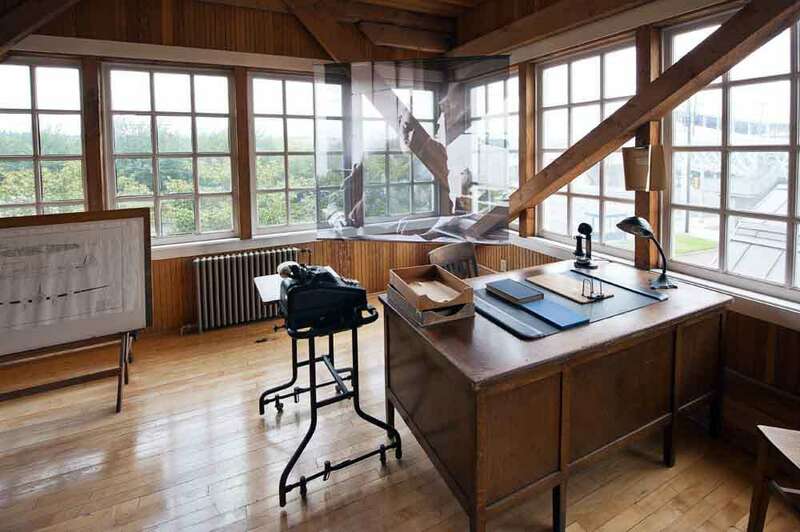 The highest deck offers the opportunity to lean out over the city by virtue of its canted windows. 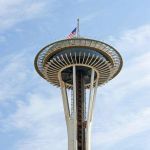 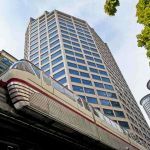 Nearing the end of its $100million facelift, the revolving restaurant is not due for reopening until 2019 but it’s still worth the visit, if only just to put your journey around Seattle into context. 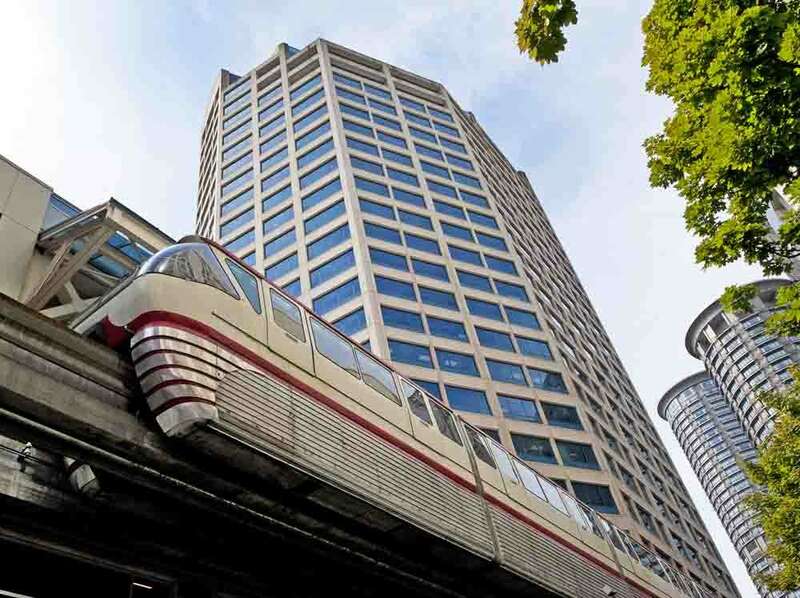 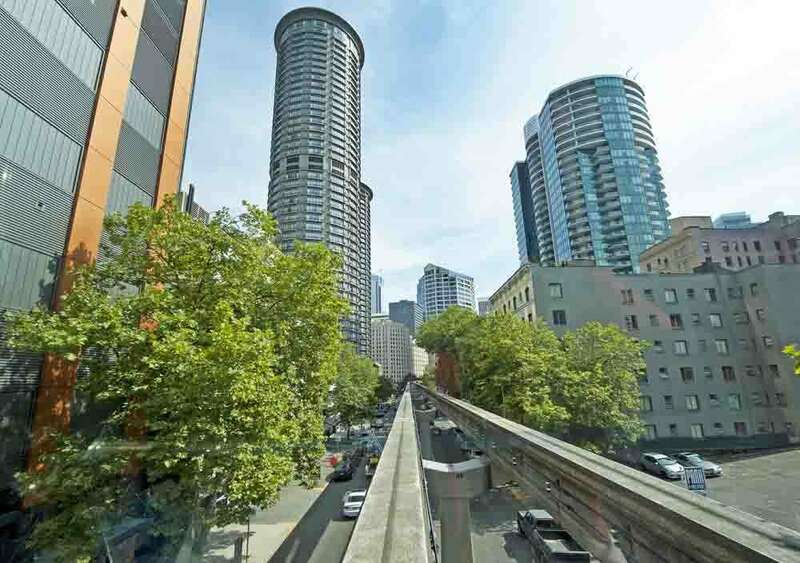 Running between Seattle Centre and Westlake Centre along and above Fifth Avenue the Monorail, also built for the World’s fair in 1962 is now more of a reminder of trends in ‘space-age’ thinking of that era than a valuable method of transport. 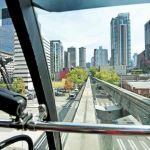 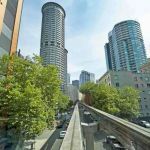 It is however a novelty and provides an interesting glimpse in, around and through buildings and structures en route between the stations – with the Space Needle being close-by at one end and Pike Street market within five minutes’ walk at the other. 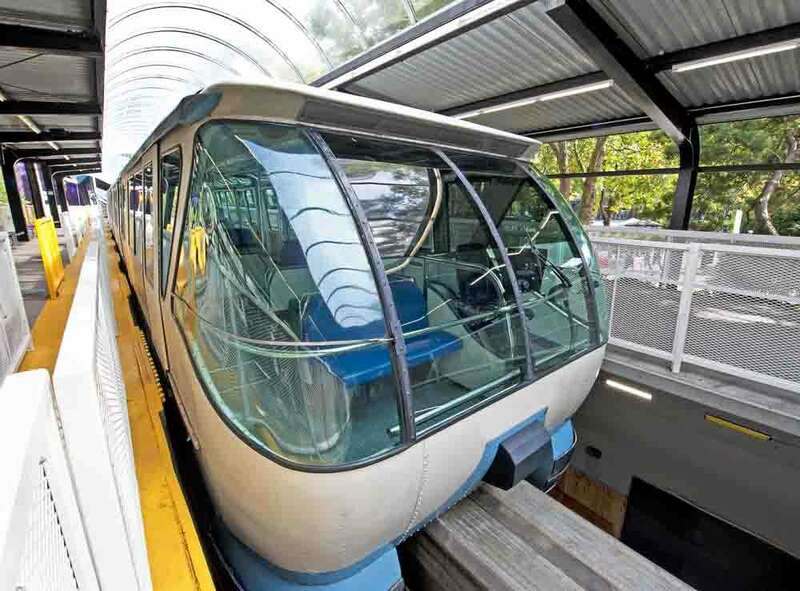 It’s easy to cast your mind back to Dan Dare days when riding this time machine. 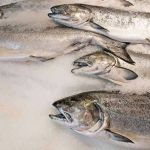 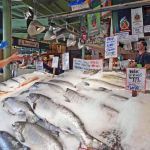 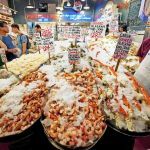 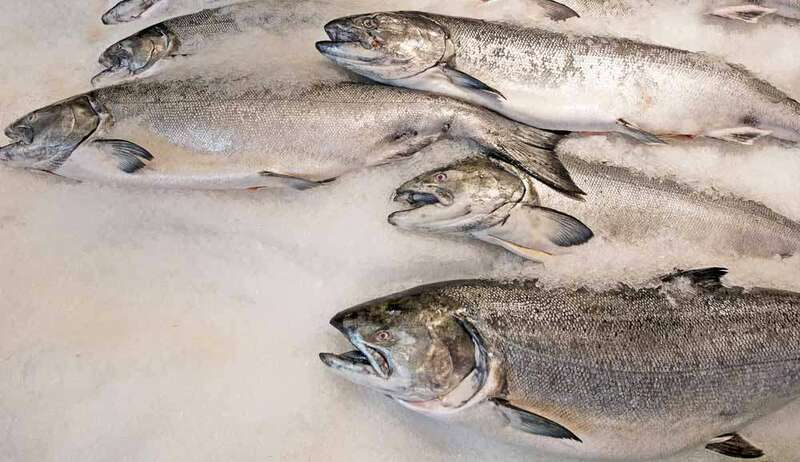 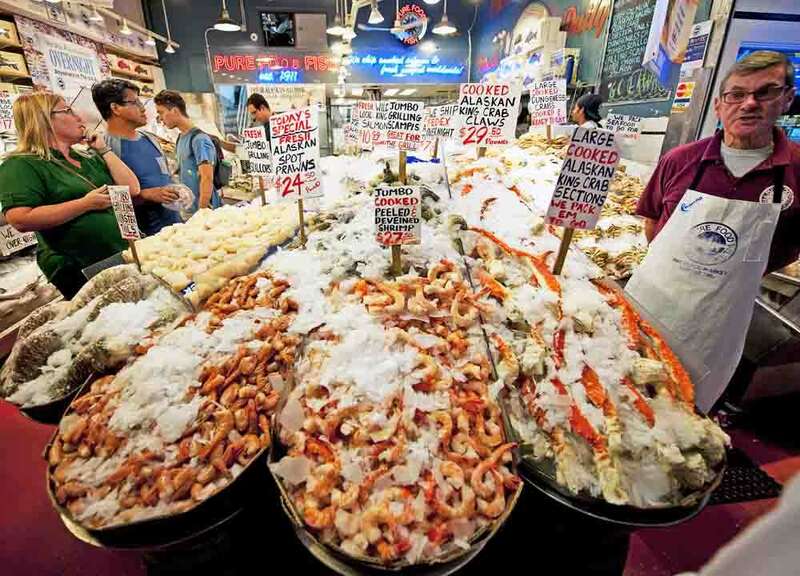 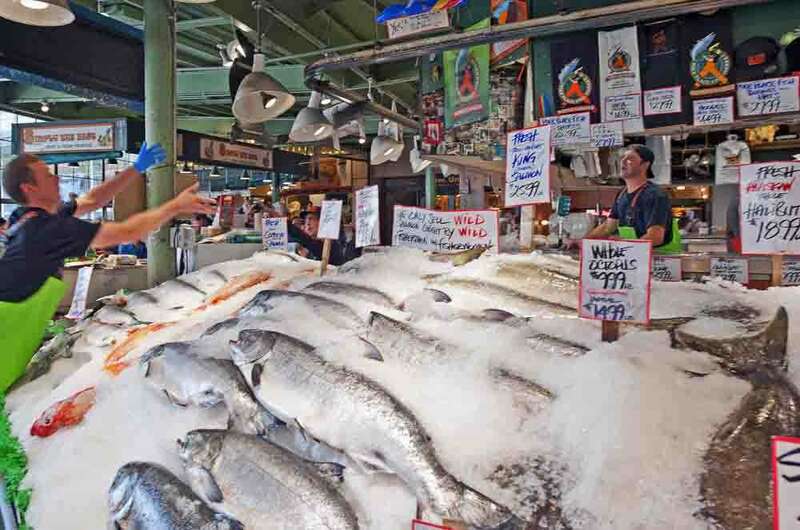 This bustling indoor market on the Elliott Bay waterfront at Pike Place takes you back in time, with its tiled floors, shed-like architecture and crammed stalls filled with fish, vegetables and merchandise piled high. 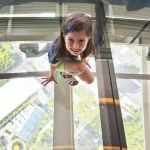 You could easily be back in 1907, when it first opened, with even an elegantly dressed Betty Boo lookalike girl who we find walking through the crowds. 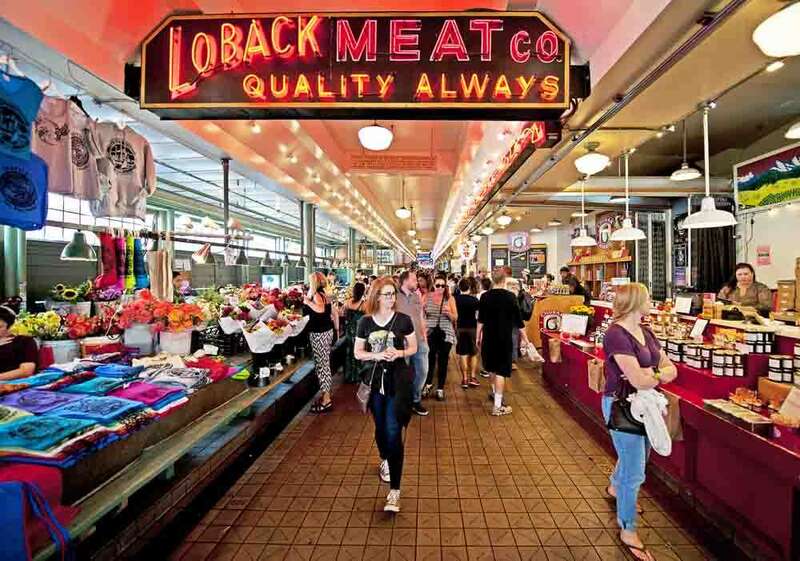 Situated on either side of the street, the whole road is a busy thoroughfare of traders, customers and visitors keen to be part of this colourful location – one of the oldest continuously operated public farmers’ markets in the United States. 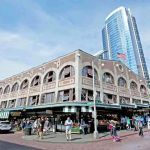 Home to local farmers, craftspeople and traders who sell on a daily basis from rented tables in the arcades – it’s also now the most popular tourist attraction in Seattle, drawing in nearly ten million visitors a year – little wonder that its busy! 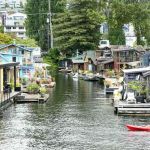 Built on the side of a steep hill, the various levels that lead down to it feature unique shops including antique dealers, comic book and collectible shops, small restaurants, and one of the oldest head shops (legal cannabis) in Seattle. 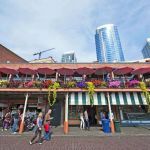 One dubious accolade is that it also houses the very first Starbucks in America, built in 1971. 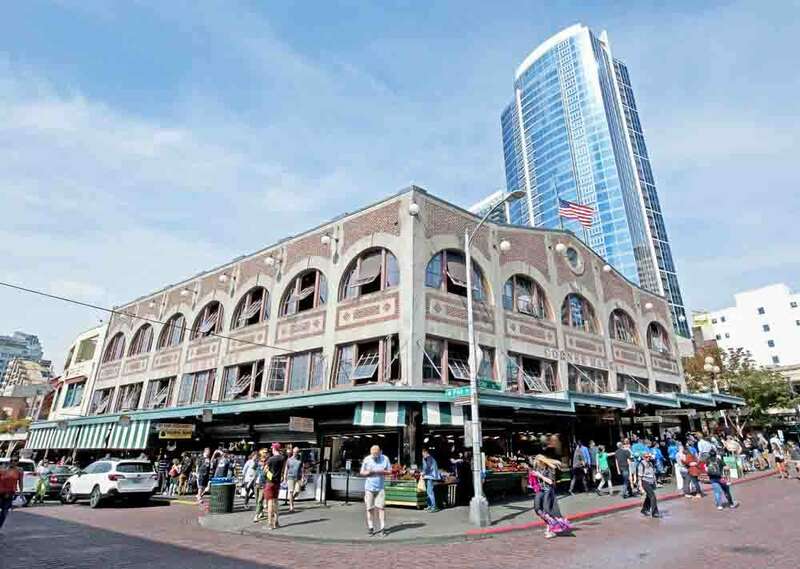 As with much of any city’s heritage it comes under threat eventually from developers and reformists and Pike Place has been no exception – from the eviction of its largely Japanese American owners during the 2nd WW to attempts at demolition it has nevertheless survived. 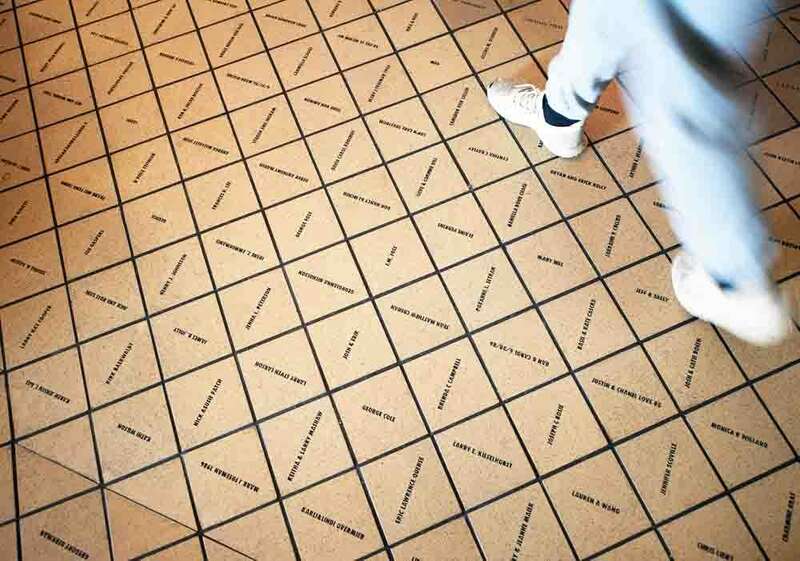 In the 1980’s it established its own social welfare programme by inviting people to pay $35 to have their name inscribed on tiles, which were to replace the old wooden floors. 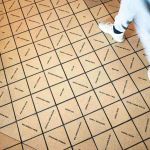 Nearly 1.6 million dollars were raised by the sale of more than 45,000 tiles. 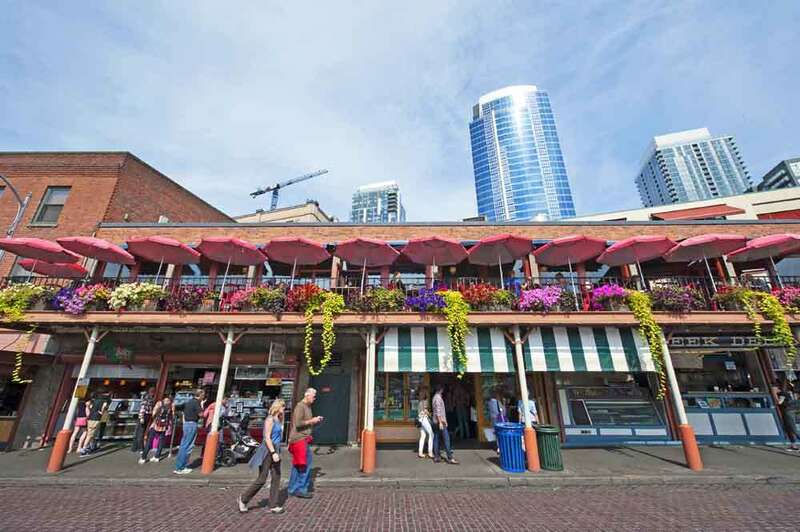 Visit Pike Street for a treat but also to follow the path of waterfront development. 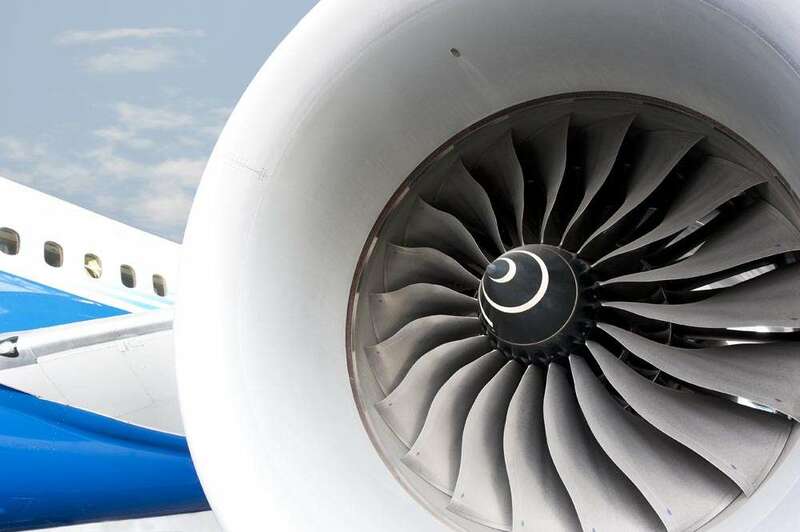 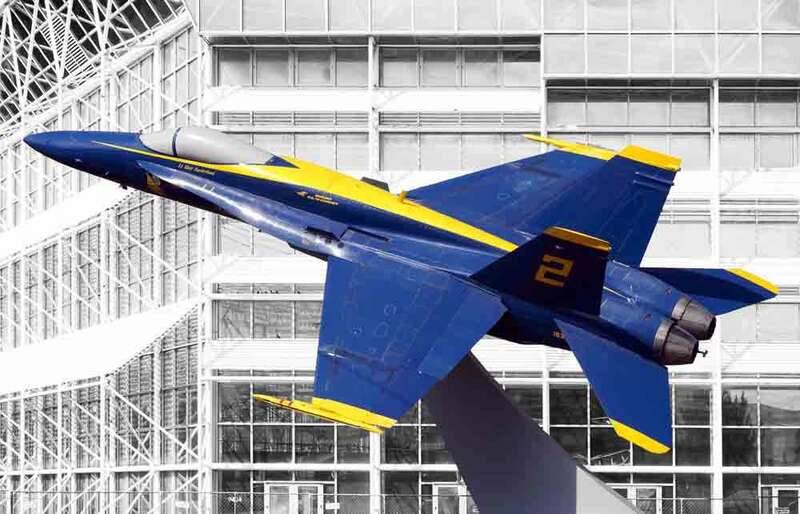 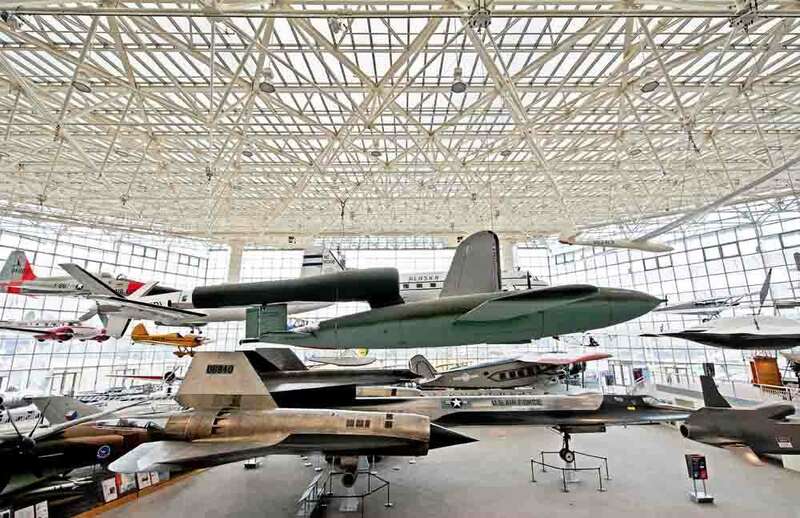 There are two significant aviation related opportunities in Seattle. 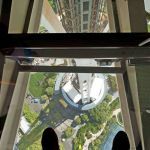 One is the million sq.ft. 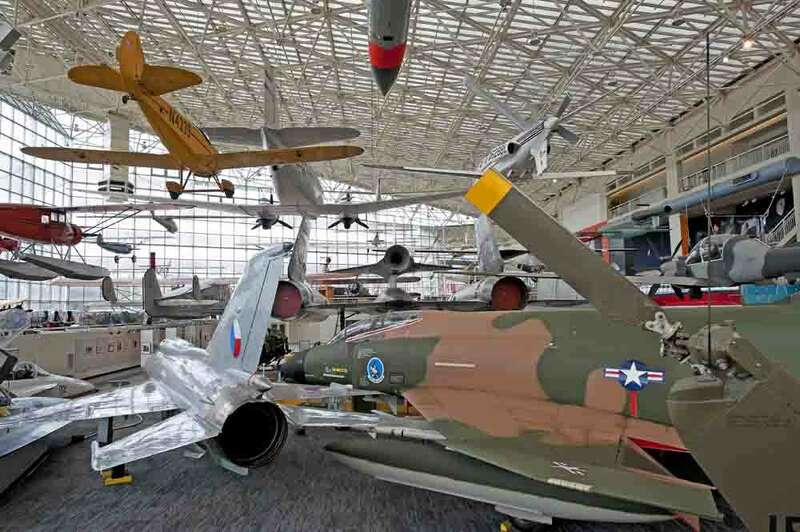 Boeing production and assembly plant at Renton Airfield (where latest generation 737’s, 767 and 787 Dreamliners are assembled) and which can be visited to view the assembly process – and the second, the more diverse and therefore perhaps broadly interesting ‘Museum of Flight’ at Boeing Airfield. 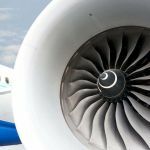 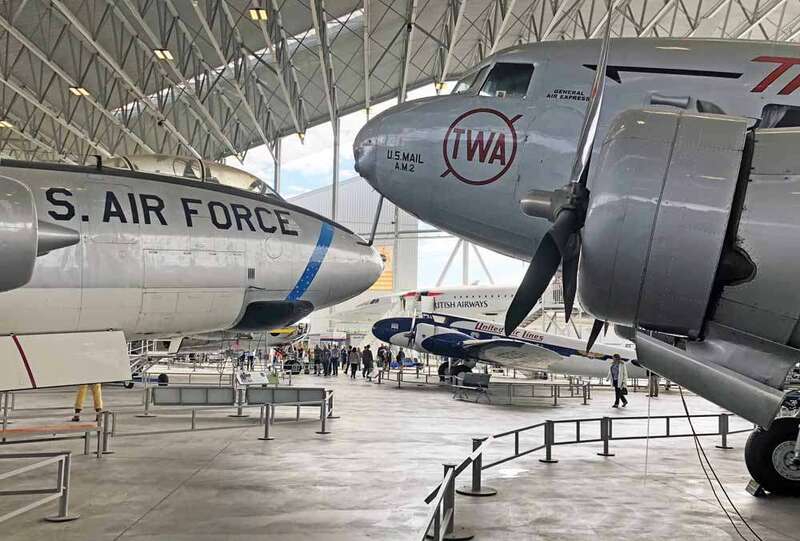 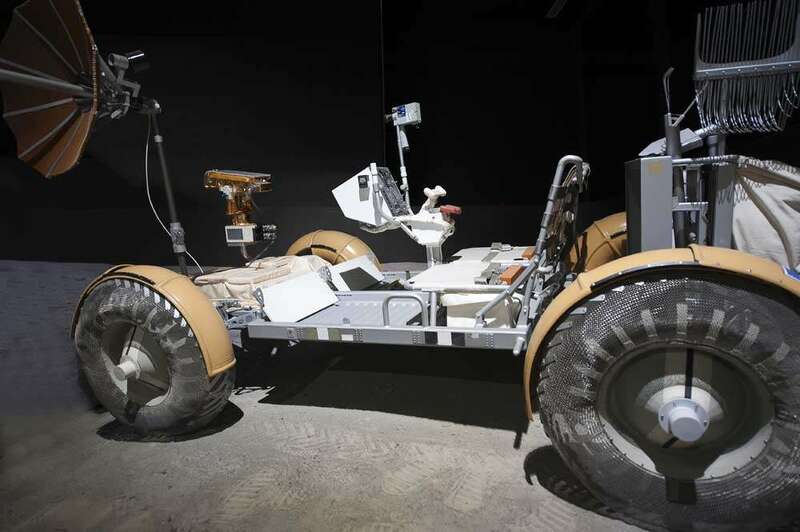 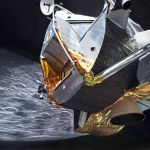 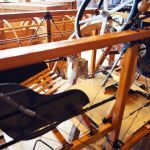 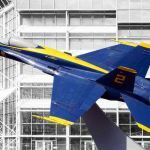 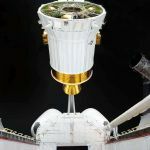 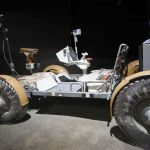 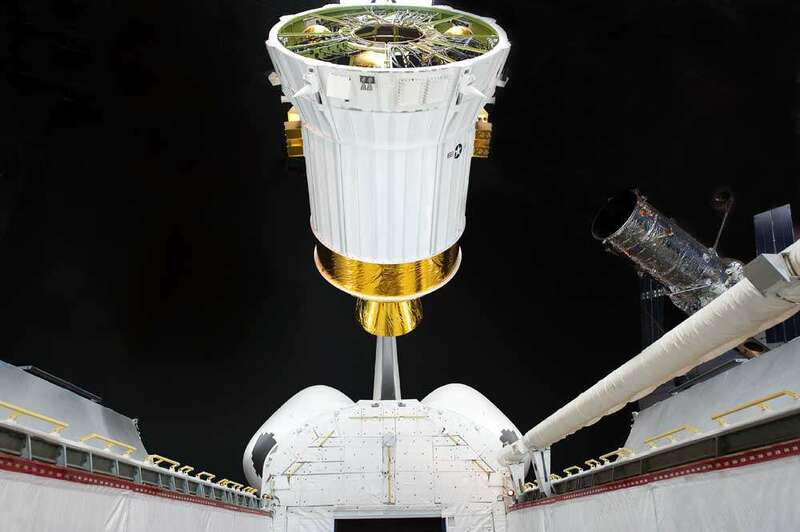 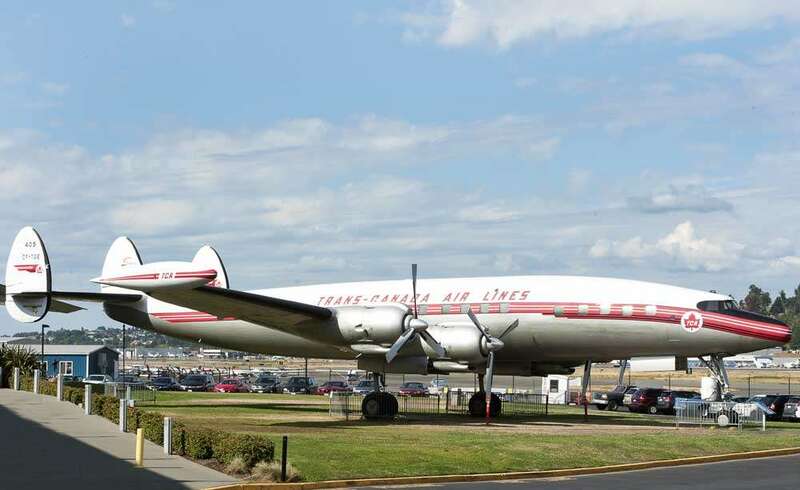 It’s the largest independent air and space museum in the world – which probably tells you all you need to know about the extent and content of its exhibits. 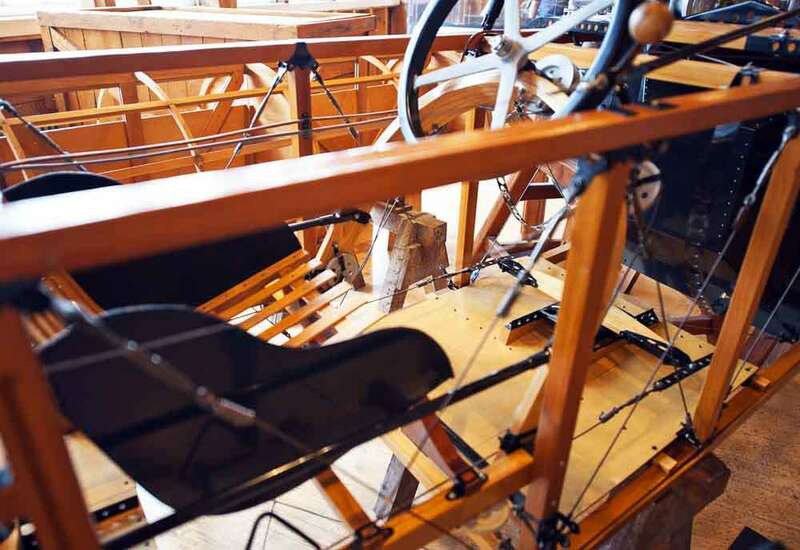 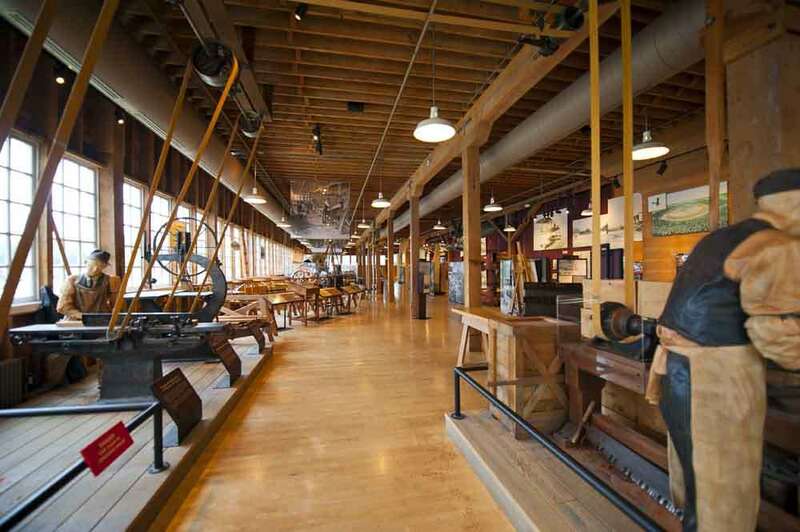 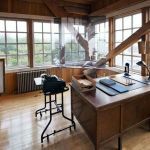 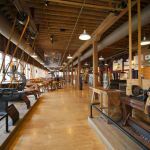 It charts flight from the earliest days, particularly appropriate because the ‘Red Barn’, Boeing’s very first factory on its original site, is beautifully restored and presented to illustrate the wood and wire craftsmanship of early aviation. 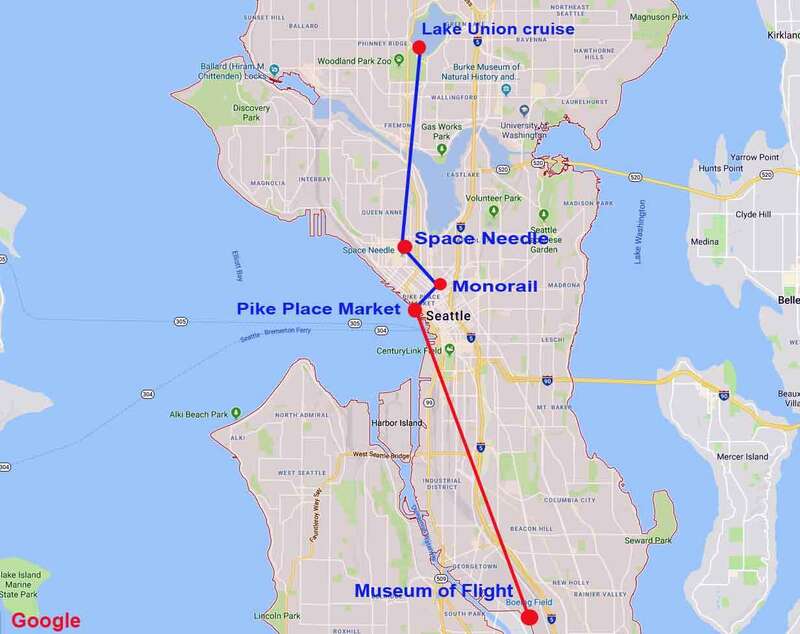 If you’re interested in flight you’ll need a half day as a minimum (if so, don’t try to fit all of these ideas into one day) and it’s the sort of place in which even those with only a fleeting interest will find plenty to amuse and distract themselves. 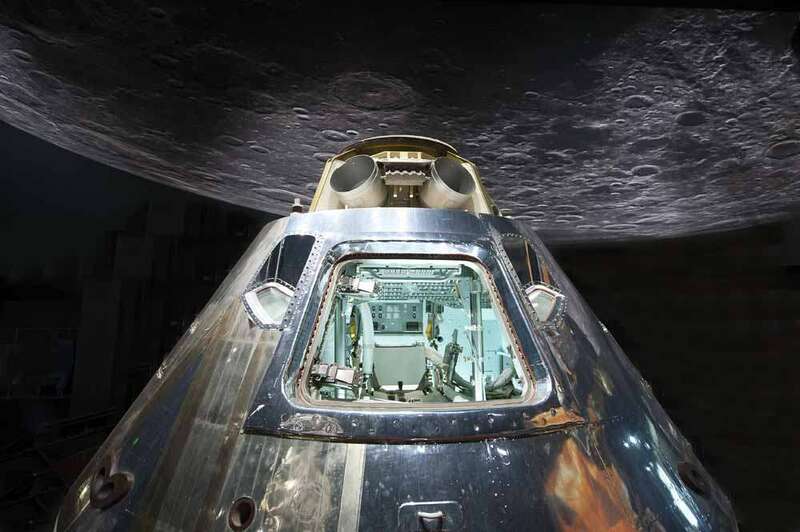 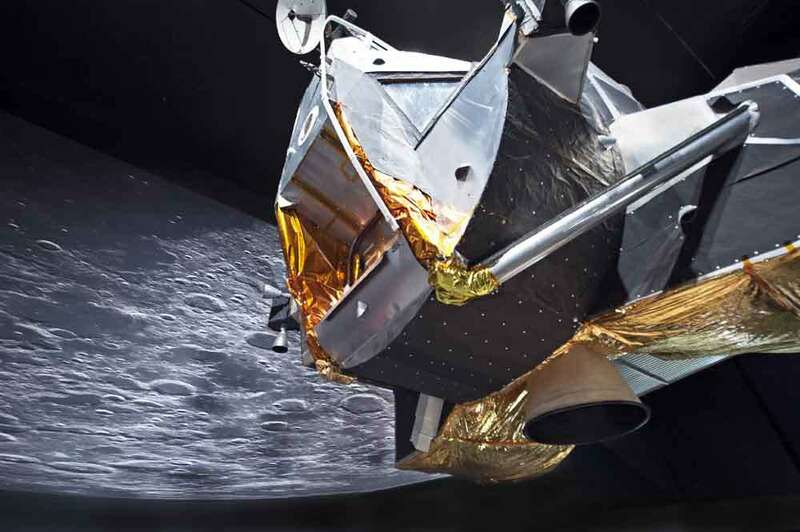 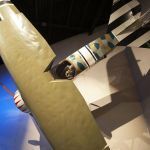 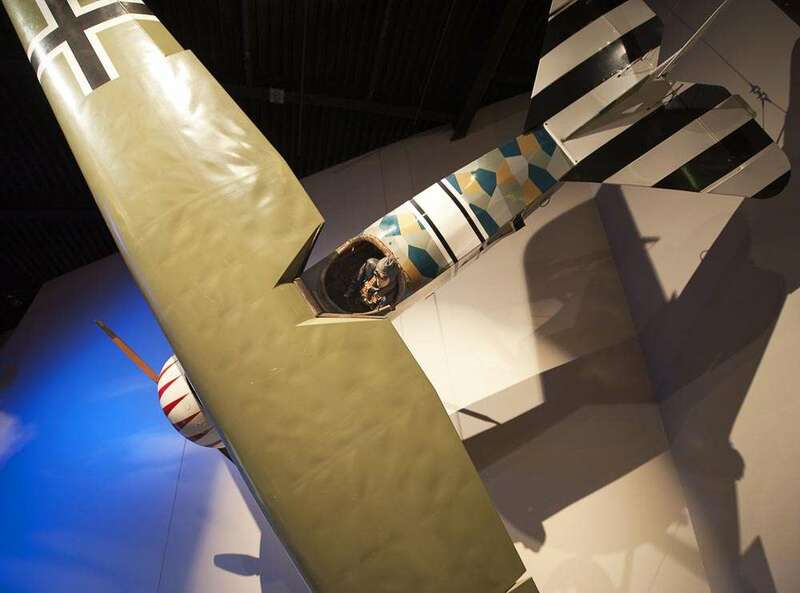 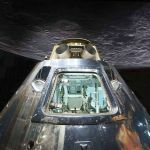 The museum covers every era of flight, including space exploration – and all exhibits are exceptionally well presented and prepared – even if one does get the sneaking impression that the USA was the only nation instrumental in almost every advance in flight! 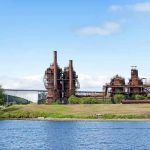 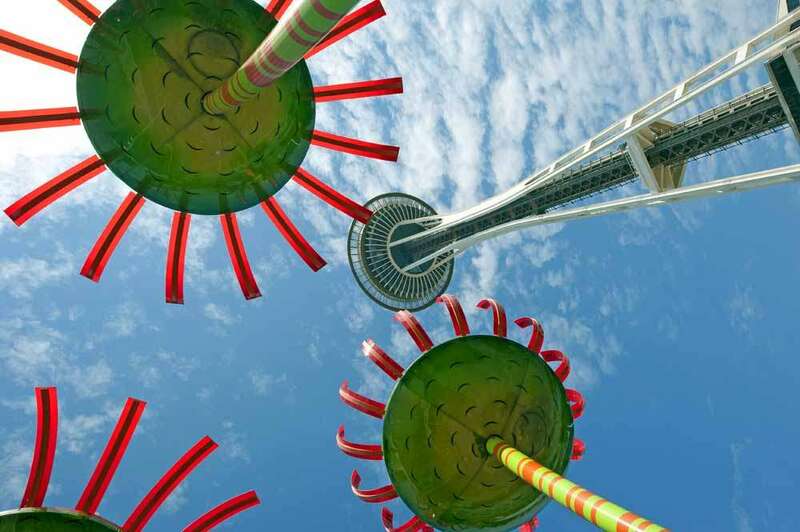 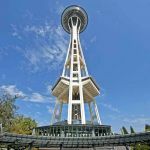 ‘Join up the dots’ of this north/south tour of Seattle and you’ll understand the evolution of the city and enjoy a rewarding dimension to your holiday that might otherwise have simply used the city as a staging point to the mountains.